Two-thirds of the Triumvirate Out: What’s Next for the Gulf? Within the last 10 days, President Donald Trump replaced his Secretary of State Rex Tillerson with CIA Director Mike Pompeo and National Security Advisor H. R. McMaster with Former US Ambassador to the UN John Bolton. This removed two of the three legs of the “triumvirate” – the other leg being Secretary of Defense James Mattis — that had been widely seen as restraining the more reckless impulses of the President. Both decisions surprised few, given the barely concealed acrimony between Trump and the triumvirate. Both McMaster and Tillerson disagreed with Trump on vital files related to US national security, including the multilateral Iran nuclear agreement (known as JCPOA) and the unprecedented summit between an American president and North Korean leader Kim Jong-un. However, the timing of the announcement—just before the president deals with Korea, Iran, and the Gulf crisis—was highly significant. Since moving to Foggy Bottom 14 months ago, Tillerson has failed to manage the State Department for several reasons—most notably, his lack of foreign policy experience and managerial obstacles stemming from the department’s 30% budget cuts. It soon became apparent that his experience as head of ExxonMobil did not help the 69th Secretary of State in terms of solving the growing managerial barriers or finding common ground with Trump on major foreign policy files. Such conditions effectively dismantled the diplomatic establishment Tillerson must employ to deal with any foreign policy crises. A situation might be more successful between Trump and the newly appointed Secretary of State Pompeo, who has more relevant experience in the army, the intelligence community, and the legislative branch. Yet it is worth asking: Did Trump fire Tillerson and McMaster because of these crises or despite them? President Trump apparently appointed General FH. R. McMaster as National Security Advisor to replace the disgraced General almost entirely because of hyped reports that McMaster was a “hawk” itching for a fight with Iran. Instead, he got a classic soldier-scholar cut in a 19th century mold. McMaster held strong views but even stronger commitment to an orderly and carefully thought out and articulated approach to the national security of his country. Together with Tillerson and Mattis, he constantly counseled the President against rash and impulsive actions even if his personal views may have been a bit more hawkish than those of his colleagues. It appears that discretion and an orderly approach infuriate the President even more when cautions come from within his own immediate staff. McMaster did, apparently, try to pander to the President but his sense of duty prevented him from doing it well enough to appeal to Mr. Trump’s ego. Of note, McMaster did on more than one occasion express more annoyance with Qatar than did his colleagues at State and Defense. His departure seemed inevitable and may have been delayed only because of the awe in which the President holds his generals. In their brief tenure, Tillerson and McMaster served as two legs of the triumvirate, together with Defense Secretary James Mattis. The triumvirate constantly dampened Trump’s unpredictable decisions, which he repeatedly made without having them vetted through the system. In addition, his initial attacks on Qatar during the GCC crisis and his policy swings in Syria all met firm opposition from the triumvirate. As noted McMaster did take a more hostile view of Qatar but did not support Saudi and UAE efforts to isolate the Gulf Emirate. Replacing two critical postings with figures more in harmony with his position on Iran is not shocking, but his choice is concerning as Bolton has repeatedly called for air strikes—whether by the US or by allowing the Israelis to carry them out—against Iranian nuclear facilities. During his election campaign, Trump promised to reverse the JCPOA and move the embassy to Jerusalem, but few expected him to break with presidential tradition and keep campaign promises that would upend America’s international obligations. Shortly after tweeting his decision to replace Tillerson with Pompeo, Trump told journalists that he disagreed with Tillerson on several issues, allowing many to infer that Tillerson’s opposition to tearing up the JCPOA was the biggest problem. In October 2017, Trump delivered a speech explaining his administration’s strategy toward Iran, along with a May 12, 2018, deadline for renegotiating and expanding the JCPOA to include limits on Iran’s ballistic missiles program and Tehran’s aggressive posture in the region. All of the deal’s co-signers (China, Russia, France, the United Kingdom, and Germany) as well as Iran rejected the proposals. Such sweeping international rejection for amending the JCPOA, including from US allies, led most to believe that Tillerson had prevailed and convinced Trump to compromise on the deadline. However, as the deadline looms ever closer, the president now faces a decision to delay once again the implementation of another core campaign promise—a delay that he places squarely at Tillerson’s feet. Others point to Tillerson’s and McMaster’s clashes with Jared Kushner, Trump’s son-in-law and advisor, to whom Trump has entrusted leadership on Middle East issues independent of the State Department and the National Security Council. For example, many believe that Kushner persuaded the president to support the accusations of the Anti-Qatar Quartet—Bahrain, Egypt, Saudi Arabia, and the United Arab Emirates (UAE)—which broke relations with and attempted to isolate Qatar over allegations of Doha’s support for terrorism and Iran. The triumvirate –Tillerson, supported by both Mattis and McMaster—understood the need for unified American allies in the Gulf region and called for a quick reconciliation to the dispute that undermined US security interests in the region. These differences ignited media reports that the UAE had influence over Kushner because of his financial ties to the UAE and his failed efforts to raise capital in the GCC. Yet it seemed that Trump and Tillerson soon put their differences aside when Kuwait launched mediation efforts. The triumvirate also apparently persuaded the president that his hopes for countering Iran and strengthening America’s role in the Middle East required a unified GCC. In these three areas—the GCC, the JCPOA, and North Korea—the president repeatedly contradicted his Secretary of State and National Security Advisor on numerous issues. Trump’s selection of Pompeo may or may not change the course of US policy in the Gulf region. Pompeo has famously demonstrated that no daylight exists between him and the president—not on any subject. As head of the CIA, Pompeo provided the president with analyses and recommendations, but —by his own admission—the president does not read them. With virtually no public record of Pompeo’s views on key issues, observers must speculate based on his Congressional record. 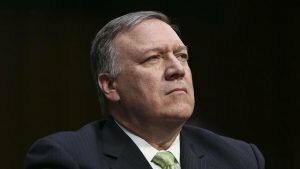 According to one Atlantic article, Pompeo shared Trump’s disdain for the JCPOA, and focused on a no-holds-barred war against jihadist terrorism, and opposition to lax immigration and refugee policies. Bolton, meanwhile, has remained loud and clear in his objections to JCPOA. 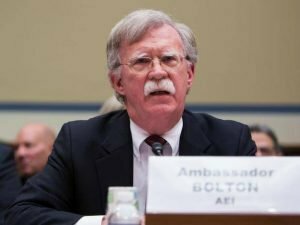 A few months before announcing the agreement, Bolton wrote an article in The New York Times entitled “To Stop Iran’s Bomb, Bomb Iran,” in which he argued that nothing will stop Iran from their nuclear ambitions, leaving military operations as the only appropriate course of action. He cited Israeli strikes on Iraq and Syria’s nuclear reactors as successful examples to end such ambitions. After the signing of the agreement to postpone America’s withdrawal from JCPOA, Bolton furiously criticized Trump’s advisers who persuaded him to stay in the deal and give a deadline for renegotiating the agreement. In January 2018, Bolton said in an article in the Wall Street Journal that Iranians will not accept any renegotiations and the US withdrawal is critical and would end limitations on European deals with Tehran as all American intellectual property would fall under the sanctions. As for the GCC dispute, both Pompeo and Bolton had little say about it in public. The CIA supported Tillerson’s initiative to write an agreement with Qatar for opening its banking transactions. Additionally, Pompeo had good relations with the former Saudi Crown Prince Mohammed bin Nayef, who was head of the Saudi intelligence before his ouster by the current Crown Prince Mohammed bin Salman (MbS). In regards to the upcoming Camp David summit series with GCC leaders, the timing of Pompeo’s appointment has complicated his ability to play a strong role in reconciling the dispute. It appears unlikely that he will have secured Senate confirmation given Senator Rand Paul’s strong opposition to his appointment. Odds makers were giving the Camp David meetings small chance of success, and they have only been further complicated by Tillerson’s departure. Meanwhile, Bolton’s stance on GCC-related issues has not been clear, especially in terms of the Gulf dispute, but in an interview he stated that he feared Saudi Arabia’s rapid reform and modernization might have a counter impact similar to the case of the Shah of Iran, whose push to westernize the country led to the rise of Khomeini. In fact, Bolton appears to have almost 19th century colonialist attitudes with disdain for desert kingdoms whose riches have made them just a little bit “uppity.” In fact, he has demonstrated disdain for Arabs in general. Barring the unforeseeable, Pompeo will have secured the confirmation and taken over Tillerson’s desk in Foggy Bottom before May 12—the date Trump declared as the deadline for undoing the JCPOA. Trump has three months at most to manage the extremely complex process of persuading five major world powers to back away from an agreement that they approved after years of painful negotiations, precisely because it advanced their own national interests. In fact, what little US diplomatic capacity survives will probably be thoroughly absorbed in dealing with the North Korea–US summit. Pompeo will be absent for most of that time. The recent firings could escalate the US foreign policy and Gulf-related issues as US diplomacy will be disabled. Replacing Tillerson and McMaster with Pompeo and Bolton also affects America’s ability to manage important strategic interests for the US in the Middle East. In reference to Iraq, Washington has essentially accomplished its declared objective of expelling the Islamic State (ISIS) from Iraq, and the American leadership has declared that preventing Iran from gaining further influence in Iraq is the next objective. Yet the United States is singularly unable to accomplish that goal. In addition, Americans have appealed to Saudi Arabia to provide billions to rebuild Iraq and marginalize Iran, which has made enormous inroads into the political and military structure of the Iraqi state. The former triumvirate – Tillerson, Mattis, and McMaster – generally agreed that the United States needs to maintain significant military forces in that country whereas Pompeo has publicly opposed maintaining large military forces in Iraq—or anywhere else in the Middle East. However, the problem is that small forces become hostage to events rather than determining them. In the longer term, Pompeo could revitalize the structure of American diplomacy and find areas of agreement or compromises with the president, which Tillerson failed to do. In the current US administration, diplomacy has a better chance of effectively taking the lead in resolving foreign policy dilemmas, especially in the wake of the departures of Steve Bannon and Sebastian Gorka—the architects of the “deconstruction” of the American government. Filling ambassadorships and senior positions in the Department of State will enable diplomacy to function with some semblance of order in an otherwise chaotic administration. At the working level, State, Defense, and the CIA cooperate much more than they compete. Speculating about what will unfold on May 12 requires going out on a very weak limb. The most likely outcome is that President Trump will symbolically “decertify” the JCPOA and then punt it to Congress to act. 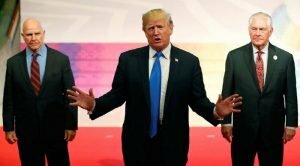 To truly undo the deal, Trump would need to persuade Britain, France, Germany, Russia, and China to go along, and it is difficult to believe that the Europeans will have much stomach for cooperating with Trump after his imposition of steel and aluminum tariffs and his ongoing haranguing on defense budgets. Persuading Russia and China—the two states absolutely essential to enforcing new sanctions against Iran—is even more fraught with risk as the US administration recently labeled them as principal adversaries. Securing their cooperation will almost certainly demand trade-offs in the form of strategic American concessions in Syria, Eastern Europe, and North Korea—concessions that Trump will be loathe to grant. By Ambassador Patrick Theros, Strategic Adviser for Gulf International Forum. “Factbox: Trump and Tillerson Disagreed on Key Diplomatic Issues.” 2018. Reuters. March 13. https://www.reuters.com/article/us-usa-trump-tillerson-policies-factbox/factbox-trump-and-tillerson-disagreed-on-key-diplomatic-issues-idUSKCN1GP2IB (March 19, 2018). “President Donald J. Trump’s New Strategy on Iran.” 2017. White House Office of the Press Secretary. October 13. https://www.whitehouse.gov/briefings-statements/president-donald-j-trumps-new-strategy-iran/ (March 19, 2018). Labott, Elise, and Gloria Borger. 2017. “Kushner’s Foreign Policy Gamble Fuels Tillerson Feud.” CNN. December 4. https://www.cnn.com/2017/12/04/politics/jared-kushner-rex-tillerson-middle-east/index.html (March 19, 2018). “Investigators Looking at Whether Kushner Business Talks Affected U.S. policy: NBC News.” 2018. Reuters. March 2. https://www.reuters.com/article/us-usa-trump-russia-kushner/investigators-looking-at-whether-kushner-business-talks-affected-u-s-policy-nbc-news-idUSKCN1GE2XJ (March 19, 2018). Friedman, Uri. 2018. “Mike Pompeo, Counterpuncher.” The Atlantic. March 17. https://www.theatlantic.com/international/archive/2018/03/mike-pompeo-foreign-policy/555593/ (March 19, 2018). “Bin Nayef Receives CIA Award for ‘Counter-Terrorism’.” 2017. Al Jazeera. February 12. https://www.aljazeera.com/news/2017/02/cia-director-medal-top-saudi-royal-170212073731973.html (March 19, 2018). Watkins, Eli. 2018. “Paul Vows to Filibuster Pompeo, Haspel.” CNN. March 18. https://www.cnn.com/2018/03/18/politics/rand-paul-mike-pompeo-gina-haspel-cnntv/index.html (March 19, 2018). Kalin, Stephen. 2017. “Go Home, Tillerson Tells Iranian-Backed Militias in Iraq.” Reuters. October 22. https://www.reuters.com/article/us-usa-gulf-tillerson-iraq/go-home-tillerson-tells-iranian-backed-militias-in-iraq-idUSKBN1CR0JR (March 19, 2018). MacDonald, Fiona, and Glen Carey. 2018. “Gulf Arabs Seen Trying to Curb Iran Influence With Iraq Aid.” Bloomberg Quint. February 14. https://www.bloombergquint.com/politics/2018/02/14/gulf-states-pledge-billions-to-rebuild-iraq-after-is-defeated (March 19, 2018). Moore, Jack. 2017. “Tillerson, Mattis and McMaster Present Trump with Plan to Stop Iran Aggression.” Newsweek. September 12. http://www.newsweek.com/tillerson-mattis-and-mcmaster-present-trump-plan-stop-iranian-aggression-663648 (March 19, 2018).